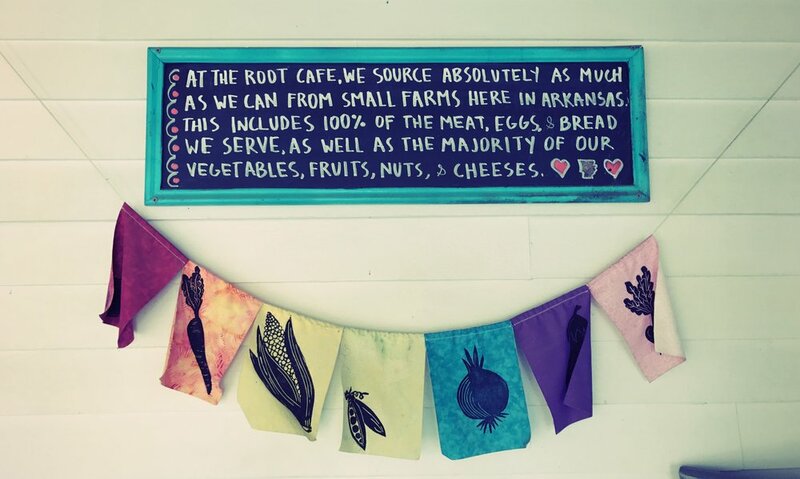 At The Root Cafe, we source absolutely as much as we can from small farms and producers here in Arkansas. This includes 100% of the meat, eggs, and bread we serve, as well as the majority of our vegetables, fruits, nuts, and cheeses. The service we provide for Breakfast, Lunch, and Brunch is fast-casual, order at the counter style. Dinner is full-service, where a host seats the guests and servers take orders at the tables. like pork cracklin´ but no pork! Our burgers are made with fresh-ground beef from Simon Farms and served with a side salad. They are cooked medium unless otherwise requested. EXTRA CHEESE +1/ DOUBLE MEAT&CHEESE +5/ SUB GLUTEN-FREE BUN +3/ NO BUN SALAD STYLE-JUST ASK! COLD-BREWED ICED COFFEE 16 OZ. CARDAMOM ICED COFFEE 16 OZ. TOASTED CARAMEL ICED COFFEE 16 OZ. Please note: the 33% Arkansas liquor tax is not included in the price of these drinks, and will be added at the end. This tax is not applied to beer or wine. Thank you for understanding math and the law.